Step-by-step instructions with detailed photographs teach you to create fabulous French braids, Dutch braids, knotted braids, rope braids, and more. Whether you’re trying to re-create a gorgeous complex twist from the popular television series Game of Thrones or a timeless classic for a wedding or formal event, the braid has never been more popular than it is today. 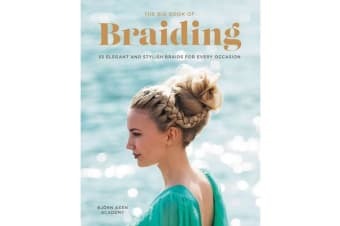 Inside this book are step-by-step photographs and detailed instructions on how to create more than fifty fabulous braids, from the Dutch braid and fishtail to the feather braid and ladder, as well as modern takes on such classics as the French braid and the side braid. Authored by the renowned hairstylists at Bjoern Axen, the biggest hairdressing academy in Sweden, The Big Book of Braiding gives you everything you need to create hair magic!